Did you know that “patients see you long before you see them”? Research from Becker’s Hospital Review shows that almost 80 percent of patients conduct online research before making an appointment with a physician. So most prospective patient’s first impression of a provider or healthcare organisation occurs online before they even step foot inside the facility. make or break their online reputation. 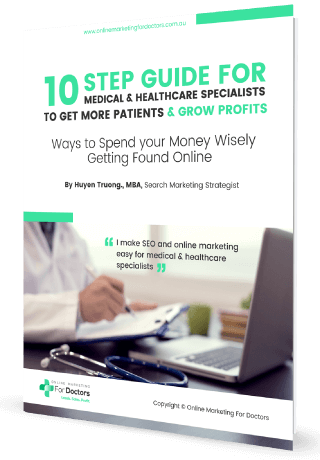 Huyen – Welcome to episode of Online Marketing For Doctors Podcast Channel – the place to be to grow and scale profitable practices. We’re your hosts,day we’re going to chat about how to handle negative reviews, and what it means for your business. Just recently, I was on my way out on a Saturday night, when I got a panicky message from one of my clients. He’d received a threatening email from a patient, who was unhappy with his recent consultation, and he said he was going to leave a bad review online. Of course, this is a situation no healthcare practitioner ever wants to deal with because it has serious potential to damage a doctor’s reputation: which is a key success element to his or her business. Doctors are usually sensitive about their reputation, you know that. And so we need to take steps to manage the review process. Did you know that “patients see you long before you see them”? Research from Beckers’ Hospital Review shows almost 80 percent of patients conduct online research before making an appointment with a physician. Most prospective patients’ first impression of a provider or healthcare organization occurs online, before they even step foot inside the facility. People today google everything: with a fingertip click, your name and practice are exposed to the whole world. And a lot of healthcare professionals have no idea that this can make or break your online reputation. We are talking about reviews on third party sites such as Google, Facebook, Real self, Rate MDs, True Local or Yelp, and that is why, in this podcast, we outline the complete guide for managing the review cycle which will make it easier to deal with negative online reviews about your practice. A patient feedback page provides a place for patients to leave remarks about their appointment experience in a confidential non-public forum. Having a dedicated ‘patient care team staff member’ enables the practice to quickly and efficiently address patient concerns, ensuring patients feel that they’re being heard by the practice. Huyen – You need to…. Ask patients for their feedback. It sounds simple enough, but you’d be surprised how many people don’t ask their patients for feedback. Immediately after their appointment is a great time to solicit feedback from your patients. Asking for feedback is a fantastic method to find points of improvement and handle small problems before they become larger issues. Steve Ask for a public online review! One of the best preventative strategies to maintain your online reputation and minimise the impact of negative reviews is to get more positive reviews! More positive reviews will outweigh the negative reviews, pushing them further down the review page and out of patients’ sight. So, the best way to keep your online reputation glowingly positive is to invite your most satisfied patients to review your practice. So let the positive review trigger an automate campaign email that invites them to leave you a review somewhere online. Make it easy for them to do by specifying exactly where you want them to post their review, and perhaps even link them directly to the page. Making it simpler, faster and easier ensures you’ll get more positive reviews. Huyen We’ve previously discussed the Importance of Patience Reviews and the 4 key factors to getting more positive reviews on our Online Marketing For Doctors Podcast: so if you haven’t listened to that yet, check out the link in the show notes below to make sure you don’t miss our great tips! Steve So now we are handling reviews, hopefully mainly positive, but also potentially negative too; so how do you monitor your online reputation? How do you keep up-to-date with all the mentions of you and your brand or competitors? It’s virtually impossible to monitor everything that happens online nowadays, but fortunately, there are great web monitoring tools to help keep you informed. Huyen Google Alerts is a free tool that allows you to track chosen keywords and phrases: you’ll never miss any important conversation happening across the web. 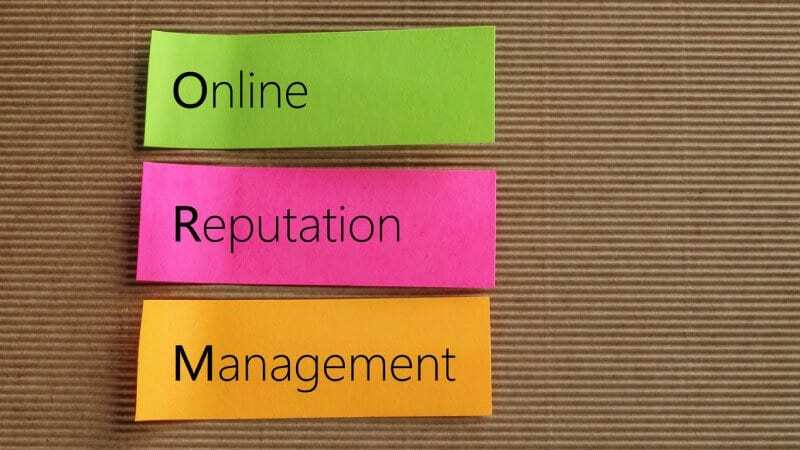 A great example would be to use your name and practice name as keywords. Google Alerts will then send you a notification when it finds new web results containing your keywords. It’s so easy! And we’ve made it even easier by putting the link to Google Alerts below in our show note, so why not give it a try? Let’s talk about the big question of this podcast… “ if you have a bad review, what will you do? Firstly is to respond privately and quickly. It’s always worthwhile trying to reach out to the patient privately, and as quickly as you can possibly can. If there’s been a misunderstanding, this offers a great opportunity to clarify what happened. Considering calling them, or offering a free appointment/meeting to allow the patient to talk about the issues they have encountered. This is a golden opportunity to peacefully and amicably resolve the problem. In a worst case scenario and they refuse to talk it out, offering a refund may be the simplest solution to addressing the patient’s concerns and getting them to remove the review. In this instance, you need to ensure the patient understands that you have done your best on their particular case, and that even if you offer a refund, it doesn’t constitute an admission of professional error. If the patient is happy afterwards, you can ask them to take down the review. In case you have to respond publicly. Sometimes privately reaching out to the patient may simply not be possible: if this is the case, then you need to respond to their comments publicly. This is tough, because you open yourself to more easy-to-post online criticism and feedback from either the poster or other people, so it is key that you don’t inflame sentiments with your public response. Huyen Also, please remember that even when a review criticizes a doctor’s medical advice, a healthcare practitioner can’t respond with specifics about the patient’s circumstances (unless the patient consents). Instead, use this opportunity to describe your standard protocols under specified conditions. If the negative review is accurate, considering apologising and explaining how you intend to rectify this problem in the future. 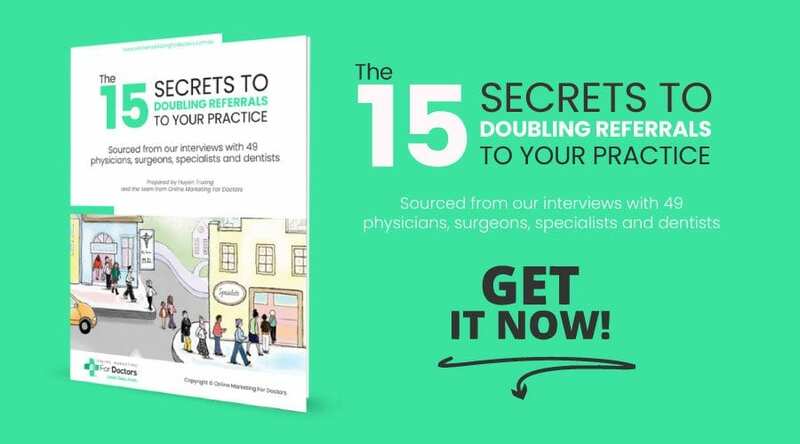 It’s inevitable that practitioners and staff will sometimes make mistakes—whether they’re related to diagnoses or customer service at the front desk. If there’s evidence the patient’s complaint is valid, a sincere public apology, and your intentions for handling this issue in the future, may be the best bet. After all, patients don’t expect doctors to be perfect, but they do expect doctors to learn from their mistakes. Huyen A good example of this, is a recent review on Park Clinic Plastic Surgery’s Google business listing profile, and I’ve included a link to the screenshot in the show notes below so you can see it for yourself. 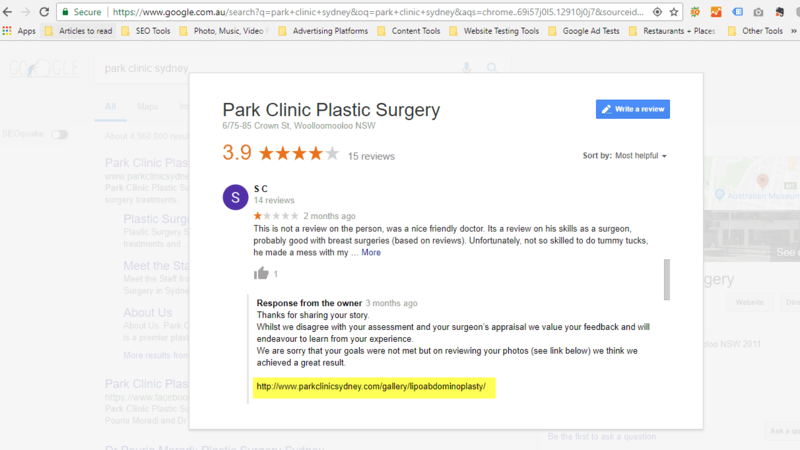 After a former patient left a 1 star Google review on her tummy tuck, the practice replied publicly. Now although they acknowledged her concerns and her disappointment with the outcome, the practice didn’t agree with the patient and instead reinforced what they had achieved, providing ‘before’ and ‘after’ photos as proof of their work. To some people, their response could appear legitimate and justified, to others it could just add fuel to the fire. But more so, it is crucial to remember the legality of what you post online. In this instance, the plastic surgeon should have sought legal advice prior to making the patient’s ‘before’ and ‘after’ photos available online, as this might cross the fine line of doctor-patient confidentiality. I feel like this paragraph doesn’t go anywhere. It’s in there, but there’s no follow on, no linking in to anything else. What’s the purpose of it?? I think this should be Step 4: it’s separate to monitoring your online reputation, it’s an action step & should be treated as such. This is the information everyone has come here for! Make it stand out. — I’d delete/reword this text or simply make it the step title. Huyen, I’ve moved this up from where you had it at the bottom of the script because it just didn’t fit in. The script had jumped from talking about bad reviews to talking about legal action, then back again and it ruined the flow, so I’ve moved it up here to make it more cohesive. If the actions taken by the patient are not acceptable to you, the remaining option is to consider instituting defamation proceedings. The law in this area is complex and it is advisable to obtain prompt legal advice, as time limits apply to bringing a defamation action. Huyen But we do have a word of warning for you here: successful defamation actions are rare. In our experience, defamation suits, particularly those involving doctors, attract significant media attention, which can potentially cause further damage to the doctor’s reputation and also, defamation suits are usually quite costly. An example of attracting significant media attention, you might have heard about the case of Australia’s largest private dental practice, Smile Solutions. they employed almost 50 dentists, specialists and hygienists, and has spent significant time in the media spotlight over the last twelve months because they were suing a patient for defamation over a Google 1 star review last year and they ended up winning the case. Steve – Over the past decade, I’ve identified about two dozen doctor vs. patient lawsuits over online reviews with similar results. Doctors rarely win in court, and many find themselves paying their patients’ legal fees as well as their own: that’s a really bad business outcome. But are there times where legal action is worthwhile? The answer is maybe: the situation becomes more complicated if the practitioner can prove that it was a competitor or vindictive party is posting fake reviews, rather than legitimate previous patients. While such lawsuits are often more successful than lawsuits against patients, the time and costs required to win them are lengthy. If you did decide to pursue this avenue, it is vital that you consult with your attorney to determine what the ideal outcome is, the odds of achieving that ideal outcome, and how much it will cost to try. Huyen If you want to know more about such legal proceedings, we’ve included links in the show notes to various articles about doctors’ lawsuits against patients so you can have a read and see how these doctors dealt with these situations. Thank you very much for tuning in today! we’d love to hear what you thought about today’s podcast: what are some other tips you have used successfully to deal with negative reviews? Our medical practitioner community would love to hear your stories! Leave your comments below and once you’re there, be sure to subscribe to our blog. You’ll receive instant access to our training, podcasts, videos, and ebook library with valuable information to help you make the most of your time and energy to grow your business! Steve we hope you enjoyed this episode, we look forward to catching you next time!